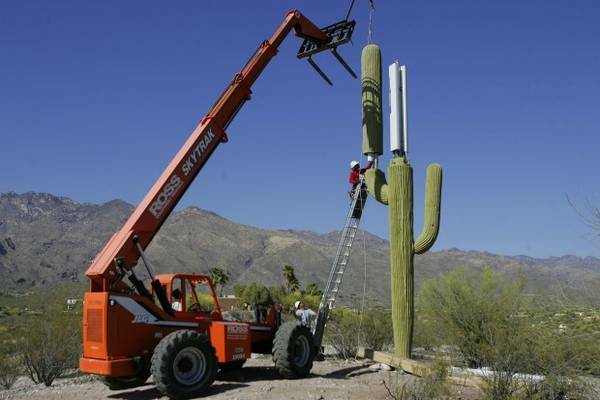 Embassy Security: Could Murals and Cactus Be the Answer? Maybe Festivus came late this year, because it appears to be the season for The Airing of Grievances about how U.S. embassy security measures have inhibited the practice of public diplomacy. First it was the Advisory Commission for Public Diplomacy rehashing old complaints, then it was a new report from the Academy of American Diplomacy with an anti-Fortress Embassy twist added by Whirled View. Now, it's a veteran Public Diplomacy officer, retired but working part-time as a rehired annuitant, who has some problems with you security people. To put it bluntly, Amb. Stevens died because violent extremists attacked our consulate facility in Benghazi three years ago and killed him. Let’s not blame him for doing his job. As Foreign Service personnel, together with other government civilians and employees of nongovernmental organizations who work alongside us in the field, we sometimes find ourselves “in harm’s way” because that is the only way we can do our jobs. Our objectives do not become less compelling just because some danger is involved. Ever since [the Benghazi attack] overseas security has been a club for politicians to use against one another. After the State Department’s Accountability Review Board sharply criticized State for “systemic failures” and “deficiencies” at senior levels, increased security was ordered worldwide. The author then describes all the ways in which those increased security measures disappointed him when he helped the U.S. mission in Tunis recover after the 2012 mob attack. The one thing that was not limited was the security operation. Throughout my six months in Tunis, our staff meetings typically focused on security and construction issues. Across the entire mission, relatively few U.S. employees had outside contact work as their primary responsibility. Off duty, I was generally able to move about Greater Tunis more or less freely. Thanks to email and Facebook, I found many old friends and contacts. Some had become “ancien régime,” but they nonetheless offered an important window into our understanding of what was happening in Tunisia. Meanwhile, official Washington still had Benghazi in its teeth, and the focus was on security, not outreach. Repeated requests by the embassy to go off ordered-departure status and bring back dependents were rebuffed. Yet just across the highway, the American School had put itself back into operation within days. Sure, there was still credible threat reporting—but we saw very little violence. Nearby, our posts in Morocco were still open, as was the embassy in Cairo, surely a more dangerous place. The net effect of this continued security-first posture was to reduce the U.S. government’s presence and operational effectiveness in Tunisia at a crucial time. What program outreach we were doing was largely in the hands of NGOs, who could bring in staff and program support without an explicit green light from M.
The embassy’s public library (Information Resource Center) was essentially closed to the general public, both because advance clearance through the RSO was required for access and because the space itself had been requisitioned as the embassy’s training classroom. The public affairs section’s multipurpose room had likewise been taken over by temporary security staff. Since even routine access for outside visitors required 24-hour advance notice, I often met contacts at cafés just beyond the barbed-wire barriers. I suppose having murals painted on the perimeter wall would be perfectly fine, but then, that really isn't OBO's job. 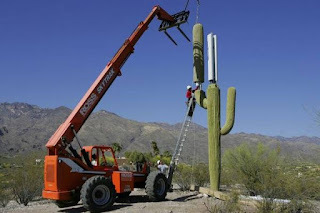 As for putting cactus on top of the wall, I suspect the problem there was the sheer nuttiness of the idea more than the cost. The author identifies a key aspect of the problem when he notes that we tolerate some types of risk much more readily than others. Somehow few challenge the risks we face from tropical disease or endemic crime, only from politically motivated violence. For that, host governments have the primary responsibility to protect our official facilities under the 1961 Vienna Convention on Diplomatic Relations and the parallel 1963 Convention on Consular Relations. As politicians and pundits club each other with talk of “sending in the Marines” (or the 101st Airborne), let’s admit that it is almost never practical or desirable to apply purely military solutions to diplomatic security issues. Exactly so, and let's do admit that what he calls military solutions are rarely appropriate for diplomatic security problems. Our political system tolerates some common types of risk quite well, but it goes bat-guano-crazy over terrorism and mob violence. That is not irrational, however. Finally, he bottom-lines it with the irrefutable statement that 'we need good security, but ...' we want other things, too. We need to maintain good “force protection,” of course, and we need to minimize mistakes, but we also need to get out of our offices to do our jobs. That means tolerating a certain level of risk. This Board presents its findings and recommendations with the unanimous conclusion that while the United States cannot retreat in the face of such challenges, we must work more rigorously and adeptly to address them, and that American diplomats and security professionals, like their military colleagues, serve the nation in an inherently risky profession. Risk mitigation involves two imperatives – engagement and security – which require wise leadership, good intelligence and evaluation, proper defense and strong preparedness and, at times, downsizing, indirect access and even withdrawal. So, everybody agrees that we need good embassy security, but ... also other stuff, like engagement with foreign audiences. It's a question of priority, of what we need most at any particular time. We needed to engage the public in Tunisia after the 2012 attack on our embassy, but ... not more than we needed to repair the damage and enhance the perimeter against a possible second attack. We needed to bring the non-essential staff and dependents back in-country, but ... not until the situation in Tunisia and the region had stabilized. These are inherently political decisions, as is the whole subject of risk acceptance for diplomatic missions. Personally, I happen to be on the side of taking reasonable risks, but, this is where I have a grievance of my own with critics of embassy security. National priorities are set at a level well about that of the Regional Security Officer, or the Ambassador, or even the SecState. If you don't like the waves of risk aversion and increased security that follow attacks such as those in Benghazi and Tunis, then write to your Congressman. If you start a petition, I'll sign it. If you run for office, I'll vote for you. But, don't blame the security budget for your problems. Diplomatic Security isn't driving the decision train. Two weeks ago the Advisory Commission on Public Diplomacy (ACPD) repeated some very old arguments that blame the current decline in public diplomacy programs on the post-1985 creation of security standards for overseas diplomatic missions, as well as the replacement of old embassy office buildings with so-called Fortress Embassies, and - most of all - a 1999 law that prohibits having stand-alone American Centers outside those new embassies without a waiver signed by the SecState. I sympathize with the goal of retaining stand-alone American Centers, but the ACPD's arguments are badly in need of updating and fact-checking. Which brings me to last Tuesday's post at Whirled View about American Diplomacy: What Went Wrong and What Can Be Done About It? Once again, it seems, those Fortress Embassies are What Went Wrong to public diplomacy programs. The post 9/11 explosion of fortress embassies [phrasing?] on the outskirts of cities has just exacerbated US diplomats’ inability to function abroad effectively. Diplomacy is foremost about interacting with people - and when diplomats are sidelined to distant suburbs and the people they need to talk with work in the city center and are not welcome in Embassy offices chances are that those discussions and meetings will be far and few between, if they take place at all. The report [of the Academy of American Diplomacy, American Diplomacy at Risk] ignores America’s fortress embassies but they too are a part of the equation. What good does it do to have crusader castles and even the most qualified diplomats based in the equivalents of the outer reaches of the universe? True, such embassies provide a single hardened location supposedly easier to defend from terrorists but wouldn’t it be better - perhaps even safer - if certain functions were separated into smaller, less visible but more accessible units scattered throughout a city? Was it even all that bad to have a very few American Center libraries torched over the decades as happened in volatile places like Pakistan years ago but the rest of the larger mission - including the Embassy and Consulates - kept out of harm’s way? The not-all-your-eggs-in-one basket argument has merit, I think, at least in the comparatively safe places where the host government is capable of providing the U.S. mission with a reasonable level of protection. Where it isn't capable or willing to do so, then all our eggs are better off collected into one big Fortress protected by our own resources. As for the rhetorical question about torched American Center libraries, well, someone must be kidding. Was it all that bad? Yes, it was pretty damn bad when mobs attacked our libraries in Pakistan in 1979, with loss of lives in every case. And it didn't act as a safety value for the rest of the mission, either, since our Embassy and Consulates were also attacked. The only difference was that the Libraries in Lahore and Rawalpindi were more vulnerable than the rest of the mission facilities, and so they were more easily destroyed. Mobs also tried to burn the Libraries in Karachi and Peshawar, but those were collocated with our Consulate office buildings and the attackers were stopped by massive police interventions. A mob of perhaps 5,000 marched to the American Center, burned it and then marched to the consulate and attacked us. Battled by 300 Pakistani policemen, they burned our cars and tried, unsuccessfully, to burn down the consulate itself -- with us inside. There were enough police to keep the crowd at bay, but not enough to disperse them quickly. After several hours, the crowd left and the police took us out in an armed convoy. On November 21, 1979, in Lahore, Pakistan, the three American USIS officers — BPAO Douglas H. Smith, BCAO V.Miro Morville, and Program Officer Lester R. Velez — were out for lunch as was FSN Administrative Specialist Mohammad Ajmal Khan. 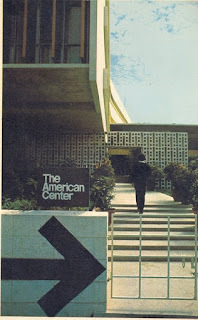 Suddenly, a mob of 5,000 rioters attacked the American Center. At that time, there were no high protective walls, no steel fences on perimeter walls, no guard booths, and no security doors on the third floor where the staff worked. When the mob first appeared, our security guard in the lobby pulled the steel shutter down to close off the entrance. In response, the crowd tore down the electrical poles and used them to break open the shutters and force their way into the building. Rais-uddin Zuberi, our budget analyst and second in command in the Administrative Section, called Ajmal Khan at his residence and informed him of the situation. Ajmal told him to have the staff move immediately onto the roof of the building, which was the designated safe haven. What really impressed me at that time was that, within minutes, Ajmal, without caring for his own life, showed up at the American Center building — entering through a back service entrance — to help us out of the life-threatening situation. He masterfully took charge of defending the lives of the 50 staff members and the visiting library patrons, who were afraid to leave the building. Ajmal led the group to the third floor and then onto the roof. He counted the staff members and asked if anyone was missing. Someone said that Umar Din, a library security guard, was missing. Everyone got panicky. Fortunately, a few of us who had returned from lunch just before the attack had seen Umar Din having lunch at a nearby restaurant. By this time, the crowd was swarming inside the American Center building. They set the lower floors of the building on fire. The invaders then climbed to the library, destroying books and furniture. Huge black clouds of smoke traveled to our offices on the third floor and then circulated in the air-conditioning ducts. The smoke was so great, they started to jump out of the building. Some of them were injured. After a while, the leaders of the mob announced that all Pakistanis should come down and promised we would not be harmed. However, the Americans would not be spared. Since there were no Americans in the building, we evacuated without any trouble. Twenty years have passed since this incident, but I still think about what would have happened if an American officer had been with us in the building. None of us would have wanted to leave an American in a life-threatening situation. I always thank God that no American was in the building at that time. Was that really all that bad? Yes, it was, and it would have been much worse for the U.S. and local employees as well as the Library patrons if the Americans had not been out at lunch when the attack began. Five demonstrators were shot and killed Sunday and 80 people were seriously injured when Pakistani riot police opened fire on thousands of protesters attacking the U.S. cultural center here after a demonstration against the British novel "The Satanic Verses" turned into a rock-throwing anti-American melee. None of the three Americans or 15 Pakistani employees inside the center at the time were hurt, but thousands of dollars in damage was done to the building, which houses an American library and sponsors cultural events designed to reinforce U.S.-Pakistani ties. "It was a peaceful demonstration that went wrong," said Kent Obee, head of the U.S. Information Service in Pakistan. Obee was inside the building waiting to receive a petition from the protesters when the riot erupted. A key factor in the survival of our employees in that attack was that the Center had been physically hardened up Fortress Embassy-style by USIA's in-house security element. Nevertheless, five protestors were shot to death literally on the door step of the American Center on that occasion. Ten years later, the same American Center in Islamabad was fired on with incendiary and fragmentation rockets, injuring a local guard and nearly killing a Library employee. Not long after our invasion of Afghanistan in 2001, the Center was closed - given up on as an indefensible location and a magnet for attacks - and public diplomacy operations moved into the U.S. Embassy compound inside Islamabad's diplomatic enclave, where they basically withered away. Of course, all that and more happened in Pakistan, and Pakistan is an especially difficult situation. I'd be curious to know how many physical attacks - drive-by shootings, mobs, bombs, arson, and so on - have occurred at all of our public diplomacy platforms around the world over time. I'd be even more curious to know whether those platforms have suffered attacks out of proportion to whatever percentage they are of all U.S. mission non-collocated facilities. If, just to make up numbers for the sake of illustration, they are ten percent of our non-collocated facilities but account for twenty percent of all attacks on those facilities, then that would tell us something about their comparative risk. Couldn't the ACPD collect those statistics? That might help them more than a White Paper full of old arguments when it comes to engaging the State Department on ways to preserve stand-alone American Centers. Wouldn’t it make more sense for economic and commercial functions to be located in financial and business districts? After all, one fifth of all American jobs now depend on international trade. A cultural section in an American Center near major educational and arts institutions, information sections close to Fleet Streets and political officers as close to the Foreign Ministries, presidential offices and parliament as possible? Even with the Internet, the most important business takes places directly and confidentially between people - not transmitted to the world via wifi. In short, “American Diplomacy at Risk” provides the opening for a foreign affairs discussion that needs to begin now. It is nearly 14 years since 9/11. Will anyone listen? Now, 9/11 had nothing to do with the “explosion" of Fortress Embassies. The Capitol Security Construction Program was mandated by a law that was passed in 1999, although it wasn’t until 2001 that new construction kicked into high gear. See this publicly available source of information, pages 11 and 12, for a concise summary of that program. And, even though security was the prime motive, that program also addresses a long-term problem of decrepit and unsafe diplomatic office buildings; ones that are too small, too old, too expensive to maintain, fire traps, and seismic risks. Haiti and Kathmandu are just two posts that have benefited from new offices and residences that didn’t fall down when earthquakes struck. And by the way, can we please stop exaggerating the remoteness of all those new embassies and consulates? After browsing the nineteen press kits for completed new embassies that are available on OBO's website, I see that few of them describe new missions in distant suburbs or outer reaches of the universe. At least six of those new embassy locations sound like they are very accessible. In Rabat, the new embassy is located three miles from the city center on a major thoroughfare. In Vientiane it is south of downtown, but with a stand-alone American Center in the downtown core. (How about that? Someone must have requested a waiver of the collocation requirement.) In Belgrade it is south of the city center. In Cotonou “the new Embassy will be located on an 8.8 acre site along one of the town’s main thoroughfares - Boulevard de la Marina. The site is in close proximity to other diplomatic facilities and ministerial buildings near the town center, and 2 kilometers away from the airport and seaport.” In Guangzhou it is in the central business district adjacent to the Pearl River. Additionally, the new embassy that is now under construction in London is inside the city, although on the edge. In Pristina, OBO is breaking ground on a new embassy inside the central city. In Mexico City, which is the biggest project OBO has going on after London, the new embassy location is just as centrally located as the current Embassy and American Center. The embassy's press release noted that "the Polanco site was chosen due to its location, with proximity to government offices, services, and major residential areas." Google maps tells me the construction site is only 4.5 km from the current embassy. Would any prospective Public Diplomacy client in Mexico City find it any harder to get to the New Polanco site than to the current Ben Franklin Library in the Zona Rosa? I can't see how. Thirty years after the first Fortress Embassies were built, it is high time to acknowledge that OBO has refined the process and greatly improved its product. In fairness to OBO, it seems that it has listened. Now, it's time for our public diplomacy advocates to say something new. Representative Jason Chaffetz was interviewed by CBS News today and he dropped the bombshell news that there are some problems with the big new U.S. Embassy construction project in Mexico City. It is an embassy that was supposed to cost $577 million to build, but the construction estimate has gone up by one third -- and the State Department hasn't even broken ground yet. No one disputes that the current U.S. Embassy in Mexico City is crowded, outdated and needs to be replaced. So four years ago the State Department bought a 15 acre plot in a former industrial district for $120 million. But there was a catch: the site had housed a Colgate-Palmolive factory for decades, which left behind hazardous waste. Colgate has been cleaning the site but it's been three and a half years and it's still not ready for construction. "It's a bit of a fiasco," said Rep. Jason Chaffetz, R-Utah. Fiasco? I've seen fiascos, and this isn't one yet. The Mexico City project is certainly a Real Big Deal for the Bureau of Overseas Buildings Operations, its first new embassy job to be executed from start to finish under OBO's Design Excellence program. Also very costly, which is a given due to the large size of U.S. Embassy Mexico, with over 1,300 'desk positions' to be accommodated. There are also environmental remediation problems to be worked out with the previous owner of the construction site. That site is a so-called 'brown field,' a property that had a prior industrial use and is being redeveloped, in contrast to a 'green field' or previously undeveloped property. Building in brown fields is part of the whole design excellence whim-wham, since it allows new embassies to be located near city centers rather than on their edges or beyond (which is a common complaint about Fortress Embassies). The Mexico City project is squarely in the center of the city, and only about 4 kilometers from the current embassy location. Mexico City, October 27, 2010 —Ambassador Anthony Wayne, on behalf of the U.S. Department of State, today signed a contract with Colgate-Palmolive, S.A. de C.V., to acquire a property in the New Polanco area of Mexico City in order to construct a new United States Embassy to replace the existing building on Paseo de la Reforma … The existing embassy compound on Reforma, as well as any excess land at the new site, will be offered for sale at a later date. Fourteen sites are now up for sale, which means that the taxpayers might come away from this deal with a profit. Justification for Department of State Operations, Fiscal Year 2015 estimates the cost for construction of the New Embassy Compound in Mexico City, Mexico at $763,500,000. The Committee is troubled that this is an escalation in cost of more than 38 percent in the two years since the initial estimate was provided. Cost increases of this magnitude, as well as reports of other new embassy project cost escalations, are of great concern to the Committee. Accordingly, in order to enhance the oversight of new construction projects, the Committee recommendation modifies and expands section 7004(d) of the bill to require that all notifications for the purchase of land and for the award of construction contracts be subject to the regular notification procedures of, and prior approval by, the Committees on Appropriations. Notifications made pursuant to section 7004(d) shall include the following information, at a minimum: (1) the location and size of the property to be acquired, including the proximity to existing United States diplomatic facilities and host government ministries; (2) the justification of need for acquiring the property and construction of new facilities; (3) the total projected cost of the project delineated by site acquisition, project development, design/construction, and any other relevant costs; (4) any unique requirements of the project which may drive up the cost of the project, such as consular workload, legal environment, physical and/or security requirements, and seismic capabilities; (5) any religious, cultural, or political factors which may affect the cost, location, or construction timeline; (6) the current and projected number of desks, agency presence, and the projected number of United States direct hire staff, Locally Engaged Staff, and Third Country Nationals; (7) the current and projected number of beds, if applicable; (8) the most recent rightsizing analysis; and (9) a justification for exceeding the staffing projections of such rightsizing analysis, if applicable. Additionally, the Committee directs the Department of State to carefully review the design and cost of the Mexico City new embassy compound and to provide updated design plans and options for reducing the cost of the facility to the Committees on Appropriations prior to the obligation of additional funds for this project from funds made available in this Act or prior Acts. Watching Rep. Chaffetz do his song and dance for CBS News was more entertaining than reading that dry appropriations bill language, I will concede. But he brings nothing new of substance. You've probably seen the news from Diplopundit already. Marie Harf, just a few weeks after she was passed over for promotion to the Spokesperson slot in favor of an ex-Navy guy, will now lose her Deputy's job to another old white man in a boring suit. And one who has already had his turn in that job before! Talk about unfair. There is no loyalty in Washington. When I think of all the ingratitude they've shown Marie after everything she's done for them, and after all the ridicule she's put up with from that boys club in the press - raise your hand if you've ever been personally victimized by Matt Lee - it is just so sad to see her sidelined into a senior adviser job far away from the TV cameras. Well, polish up that resume. The next election is barely a year away, and Hillary's campaign will need plenty of top-notch media expertise. My good friends in the Bureau of Overseas Buildings Operations got bad news yesterday when one of their coworkers was indicted on charges of fraud and conflict of interest and it was announced that a former coworker, recently retired, pleaded guilty last month to conflict of interest charges in the same scheme. And what was the purpose of all this conspiring and defrauding and conflict of interest? It was to sell overpriced soy protein shakes to security guards and construction surveillance technicians working at OBO construction sites. Yes, really. The two OBO officials ran a multi-level marketing business on the side, and sold the products to employees of an OBO contractor who provides personnel to monitor construction sites while new embassies are being built. 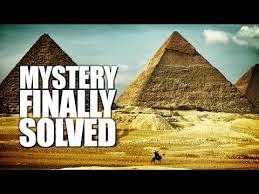 At some point, the two crossed the line into crime when they began to approve fake invoices that reimbursed OBO's site security program contractor for all those soy shake purchases. Tony Chandler, 68, of Severn, Maryland, and Marvin Hulsey, 52, of Stafford, Virginia, were indicted by a federal grand jury today on charges of conspiracy to commit wire fraud and wire fraud. Chandler also faces charges for conflicts of interest in the same indictment. According to the indictment, Chandler was employed by the U.S. Department of State with duties as a contracting officer’s representative in the Bureau of Overseas Buildings Operations. In that capacity, Chandler was responsible for oversight of the contractor that employed Hulsey as a program manager. Apart from his government employment, Chandler was an authorized distributor of nutritional supplements for a multi-level marketing company. From 2008 and continuing into 2010, Chandler earned a commission of sales for nutritional supplements that were sold to employees under Hulsey’s supervision. The employees were reimbursed by Hulsey’s employer for the cost of the nutritional supplements, after which Hulsey, through agreement with Chandler, caused fake invoices to be created and submitted to the U.S. Department of State. Knowing that the cost of nutritional supplements was not an allowable cost, Chandler approved many of the fake invoices in his official capacity, causing the U.S. Department of State to make fraudulent payments back to Hulsey’s employer. Chandler earned a commission from the multi-level marketing company for each sale of nutritional supplements. In a related case, on April 23, 2015, Gene Goodsell, the former U.S. Department of State supervisor of Chandler, pleaded guilty to a conflict of interest. According to documents filed in that case, Goodsell, who sponsored Chandler as an authorized distributor of nutritional supplements and earned commissions on each sale made by Chandler, became aware that Chandler sold nutritional supplements that were billed to the U.S. Department of State, and despite then knowing of his own personal financial interest in the contract, Goodsell continued to make official decisions concerning the contract. Not to condone anyone, but maybe an unindicted co-conspirator here is the multi-level marketing business model, with its constant monkey-on-the-back need for 'topline' distributors to recruit more 'downline' layers to the pyramid. The guy at the top probably paid a license fee to become a distributor, and probably also had to sign a contract to buy a certain product volume each month or quarter. He certainly doesn't want to drink all those shakes himself, so he basically solicits everybody he knows to recruit 'downline' layers, who recruit everybody they know, and so on, until someone somewhere has to actually buy the products. The 'topline' distributor then, in theory, receives a percentage of sales made by each lower layer of the pyramid. I doubt it really works out that well for most distributors. Making the U.S. taxpayer the unwitting bottom layer of the pyramid was a great solution to the multi-level marketing dilemna, but unfortunately for my friends in OBO, it's not legal. "Surprisingly, the 49-year old employee doesn’t even own a pet, and would have ingested nearly 3000 dog biscuits per day during his work hours"
The BBC reports that Burundi's President Pierre Nkurunziza says he has returned to the country and his troops are in control of key points, a day after a coup attempt. How bad is this news for us? Well, whenever the leadership of one of these little Central African counties comes into question, they tend to just murder everybody. Not really. They live for the opportunity to settle scores. And they've got a lot of scores to settle. The coup attempt may have failed, but the danger and disruption go on for the duration. 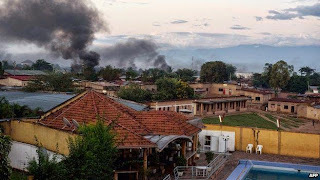 The U.S. Embassy in Bujumbura announced that its personnel will shelter in place for the moment. Not much else they can do, as long as the airport remains shut down and the land borders are closed. 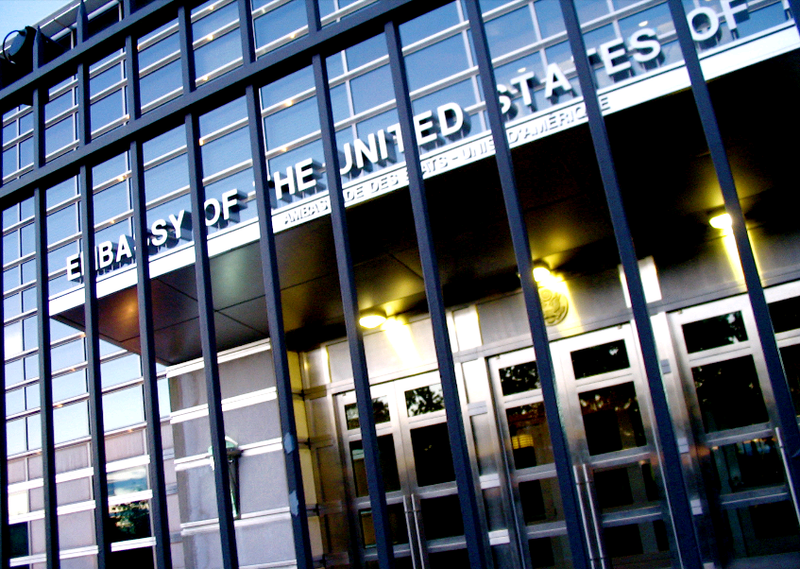 Hey, look, a picture of a U.S. embassy with a fence right in front of the entrance! What do you think when you see that? It makes me think "that's a really screwed-up situation since that building must have no setback distance at all, which makes it totally vulnerable to terrorist attacks and politically motivated violence, and we ought to replace it with a safe, secure, and functional Fortress Embassy." But that's just me. Turns out I'm wrong, because the photo is on the cover of the United States Advisory Commission on Public Diplomacy's new report about how Fortress Embassies are actually ruining everything, also known as Public Diplomacy at Risk: Protecting Open Access for American Centers. Read the full report here. The space for maximum engagement is the free-standing, U.S.-controlled American Center. Once the American Centers move to these [new embassy and consulate] compounds, they transform into less accessible Information Resource Centers (IRCs). IRCs are located in more remote locations, present more restrictive environments, and attract six times fewer visitors than American Centers. ACPD believes it is imperative that we reconsider how the relocation of free-standing American Centers to U.S. embassy, consulate and annex compounds can complicate the essential goals of public diplomacy to understand, inform and engage foreign audiences to advance U.S. foreign policy ... We are concerned that the closing of American Centers is now accelerating and we emphasize the need for the selective and flexible application, on a case-by-case basis, of security standards. The report is new but the contents are thirty years old. "This white paper is a follow up to the 1985 ACPD report, 'Terrorism and Security: The Challenge for Public Diplomacy,' which was submitted in reaction to the Inman Standards [sic] and their possible effect on the U.S. Information Agency (USIA)." Indeed, it follows the earlier report so closely that all the arguments it makes are recycled from 1985. If you've had any experience with public diplomacy matters since the year Back to the Future came out, since New Coke was launched, since the internet has existed over the years, then reading this report might be like experiencing an 80s nostalgia band. The 1985 report was a plea to retain independent, stand-alone, and reasonably security-free American Centers outside of U.S. diplomatic facilities, but that idea lost out to the security recommendations made by the Inman Panel in 1985 and later codified into law by SECCA. New physical security standards were created which impeded the free operation of public diplomacy programs, the U.S. Information Agency lost its independence and was folded into the State Department, and around 140 new 'safe, secure, and functional' embassies have been built since then with only a few of them retaining a separate, stand-alone, American Center. The Advisory Panel on Overseas Security at the State Department, or the “Inman Panel” (as it was known in honor of its Chairman, Admiral Bobby Ray Inman) created the Bureau of Diplomatic Security and proposed the Inman Standards, which stated that all embassies should be set back at least 100 feet from the street and be located on plots of 15 acres or more, and preferably outside of city centers. It was also recommended that U.S. Information Agency (USIA) libraries also relocate from city centers to the fortified embassy compounds. That's wrong on all counts. The Inman Panel proposed no security standards at all - rather, it proposed that an interagency body ought to create mandatory minimum standards - and it said nothing about what size plots of land should be acquired for new embassy construction or where those plots should be located. The ACPD has had thirty years to read the Inman Panel report; where do they find any of that stuff in it? To be sure, most of the Fortress Embassies that have been built since Congress began funding new embassy construction do have 100 feet of setback from their property lines, and they are on plots of land large enough to collocate all mission functions, and large plots of land do tend to be available and affordable only outside of city centers. However, don't blame the Inman Panel too directly. Those are all inevitable consequences of embarking on a strategic program to replace most of our old embassy facilities, as mandated by public law. See this publicly available source of information for an impeccable summary of that new embassy construction program, starting on page 8. Blame or credit Congress for that, not Inman. And, there is the straight-out-of-1985 argument that new embassy locations will not be served by public transportation, leaving public diplomacy clients with no way to get there. That one wasn't supportable even in 1985, and since then we've had much experience to the contrary. The ACPD cites U.S. Consulate Mumbai, India, as an example of a PD program that suffered after it lost its stand-alone American Center and "moved into [a New Consulate Complex] that is remote from the city center and far from major transportation lines." Actually, U.S. Consulate Mumbai was relocated to the city's new Bandra Kurla Complex where it is served by an abundance of public transportation. The public can get a ride there if it wants, and the same is true of other new embassy locations. If the public isn't visiting our American Centers as often as it did back in the 80s and before, maybe there are reasons for that apart from our modern-day security measures. Like the fact that, even in the developing world, people can find air-conditioned buildings and internet access almost anywhere these days. Surely the ACPD must have statistics on this matter. Here's something I'd like to see the ACPD report on: did the number of visitors to the stand-alone American Center in New Delhi remain steady during the same period when visitors declined in Mumbai, or did the numbers decline in both places? Two PD programs in the same country, one located in a legacy stand-alone building that was built for USIA in the 1960s, and the other absorbed into a new Fortress Embassy about five years ago. That's practically a controlled experiment. If the numbers support ACPD's case against Fortress Embassies, then they should make them public. A worldwide policy for open access to [Information Resource Centers, i.e., the libraries which have been absorbed into new embassies and consulates] that applies to all posts is necessary. This would lift "by appointment only" restrictions where they exist, create a separate security screening from the main chancery, permit unescorted access, and allow use of personal electronic devices and wireless internet access. Okaaay ... so we should let our foreign visitors drop in on our diplomatic facilities whenever, and walk around by themselves using their own electronic devices as they see fit? What could possibly go wrong? Other than what has already gone wrong, I mean. But, do we need more computer intrusion problems? Ironically, ACPD could have made a security-based argument that "open access" is both necessary for its programs and cannot be done inside a diplomatic facility without creating unacceptable risk to computer networks. That was a lost opportunity to get aboard the security bandwagon. Of course, the ACPD makes a bold proposal for ending all the security nuttiness that effects its programs. Since Congress caused a lot of the problem when it passed a law that requires all new diplomatic facilities to have at least 100 feet of setback distance, and to collocate all offices and agencies in one big compound, then it could just pass a Sense of the Congress resolution saying it doesn't really intend for that law to apply to American Centers, and encourage the Secretary of State to freely use his authority to grant waivers letting them stay outside of Fortress Embassies. 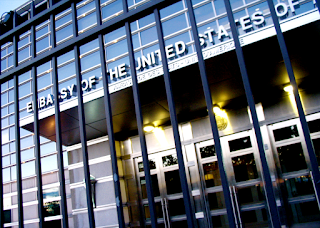 after taking into account relevant security considerations, the Secretary of State should consider placing United States public diplomacy facilities at locations conducive to maximizing their use, consistent with the authority given to the Secretary under section 606(a)(2)(B) of the Secure Embassy Construction and Counterterrorism Act of 1999 (22 U.S.C. 4865(a)(2)(B)) to waive certain requirements of that Act. That same Senator Kerry is now the Secretary of State. The ACPD therefore must already have the most receptive audience possible for requests to waive the law whenever new construction threatens one of the remaining autonomous American Centers. So, why hasn't that solved the problem? A waiver process exists; isn't anyone using it, or are they using it but getting denied? In the case of Consulate Mumbai, for instance, did the post even request a waiver? We might want to look into that before calling on Congress for another resolution the same as the last resolution. Despite it all, I really like American Centers and hope they can remain a viable platform. That's why it annoys me to see the ACPD rerunning half-baked arguments that didn't work for them thirty years ago. Have they learned nothing and forgotten nothing? Dropped Glock Found by Tot - Back to School For Capitol Cops? 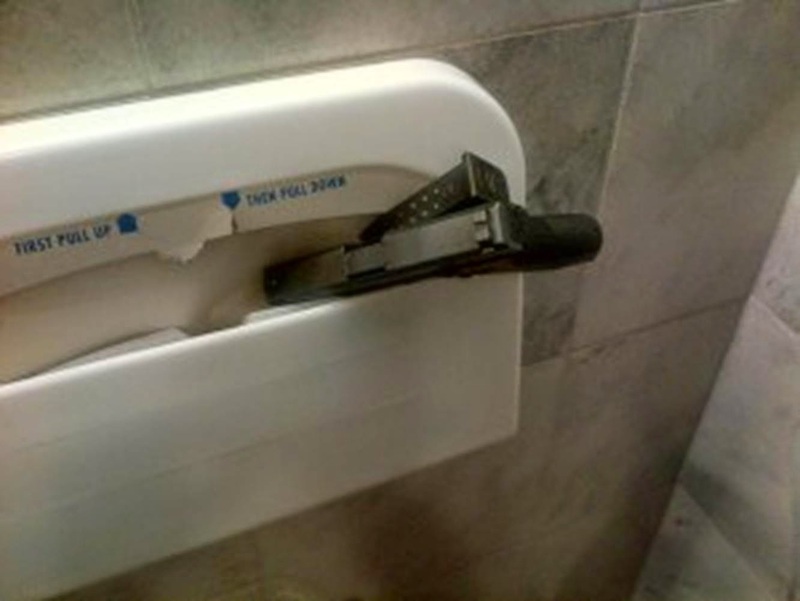 So it seems that some United States Capitol Police officers have a bad habit of leaving pistols behind when they exit the gent's bathroom. Two of the USCP's pistols were found by surprised visitors - one of them a child - since January, and a third was found by a janitor last month. Does everyone on the USCP need to be retrained? Since at least two of the three culprits were dignitary protection guys and not regular Capitol Police officers, maybe that retraining ought to be focused on them, where it evidently belongs.